First Lady Michelle Obama Discusses Veterans, Her Family, Trayvon Martin Michelle Obama's new signature public issue is to give support to U.S. military veterans and their families. In an interview with host Michel Martin, the first lady discusses that plan, as well as two issues in the news: the Trayvon Martin killing, and Democratic strategist Hilary Rosen's statements about Ann Romney. First lady Michelle Obama says raising her two daughters in the White House "has been less stressful than I would have imagined." Seen here at the White House in March, the first lady's new project aims to help military veterans and their families. 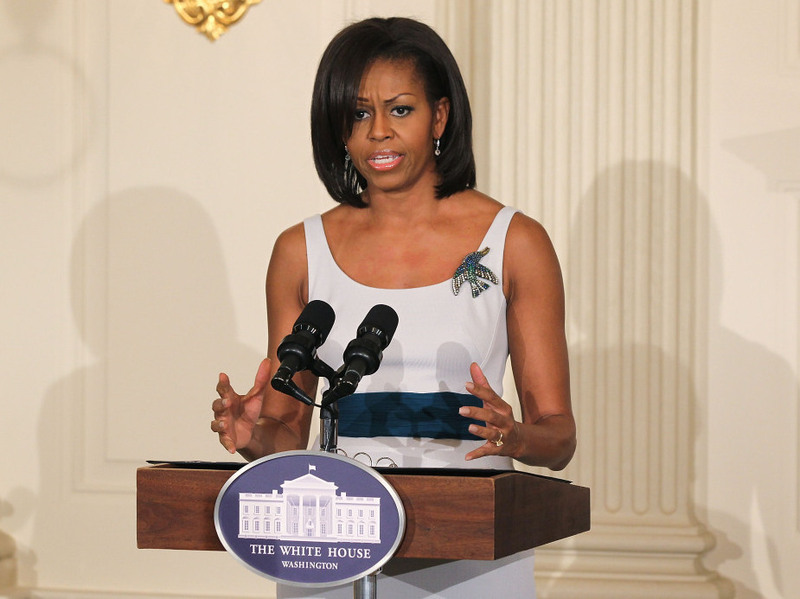 First lady Michelle Obama wears many hats in the White House. In addition to being President Obama's closest confidante, she's also a mother whose two daughters are growing up in one of the most public homes in America. And as first lady, Mrs. Obama has taken on her own signature public issues, as well. Her Let's Move campaign has brought attention to the growing epidemic of childhood obesity. She has encouraged children to eat right and get plenty of exercise. And as she tells Tell Me More host Michel Martin, Mrs. Obama has also been working on a new initiative with Dr. Jill Biden, wife of Vice President Joseph Biden, to help U.S. veterans integrate into civilian life and cope with the lasting effects of wartime deployments. Their Joining Forces campaign is an effort to help the families of more than 2.2 million Americans who have served in Iraq and Afghanistan. The project seeks to provide more support for American veterans, some of whom face unique challenges in getting a job, finding medical care and other issues. In the interview, the first lady spoke about two other issues that have been in the news lately: the Trayvon Martin killing in Sanford, Fla., and the controversy over Democratic strategist Hilary Rosen's statements about Ann Romney, wife of Republican presidential hopeful Mitt Romney. "All I can say is that my heart goes out to the parents. Because we all, as parents, understand the tragedy of that kind of loss. And I think that's really the thing that most people connect to. And it's important for us not to lose sight of the fact that this is a family that's grieving — and there's been a tremendous loss. And we all have to rally around that piece of it. "I think we all need, as a country, to continue to talk about these issues, to understand our communities and the challenges that we face, which are different and unique, depending upon where you live. ... [America] is a wonderful place to live. But because it is so diverse, our challenges are complex. "So there isn't, you know, a one-shot solution to this. It is complicated; it takes time; it takes openness; it takes compassion; it takes patience; and it takes a lot of work." "Let me tell you: The one thing I believe is that families are off-limits. And I think my husband said it, and he was clear on that. And I totally agree with him. "I also — my comment, that I tweeted, which was, we need to respect all women, in whatever positions and roles they play in this society. That's where we need to be. And I think that's all I have to say on the issue." "It's been a privilege. And there are definitely pressures that come with being in the spotlight. But they are far overshadowed by the amount of great things I've been able to do, and the impact I've been able to have. "And to be able to do it in the warmth of the White House, and to do it around people who do care about my kids, and a country that has been respectful of my children, and their privacy — it has been less stressful than I would have imagined, for me. "But, our girls are good. And I will keep working, always putting them first — as I think any family would, any mother would, [with] their children. I don't think I'm different in that respect. I think in the end, I want to make sure that my kids come out of this thing ... in one piece. But I also know that that's how the rest of the country feels, as well. So, for that, I'm grateful." "On PTSD, the thing that I want to make sure people understand is that the vast majority of veterans and military families aren't dealing with any kind of mental health. But there are — these are what are called the 'invisible wounds' of this war. And many times, they don't present. "We got a commitment just last week that 3 million nurses are going to be trained to better identify these signs. Because when these troops come home ... they're not always going through the VA system for medical care. They're going to show up at community hospitals and clinics." "I think employers need help in understanding how to translate a military career. Let's take the average [military] spouse. You show up in an employer's office, and it's shown that you've changed jobs every two years. Well, to many employers, that could be viewed as a red flag. "But the truth is that you've made those moves because you're serving your country. And each time, you've found a career, and you've been able to provide for your family, and you've continued to volunteer, and on and on and on. So, there are many different ways that a military person's career can be translated, and a lot of times, the civilian private sector doesn't know how to make that connection."